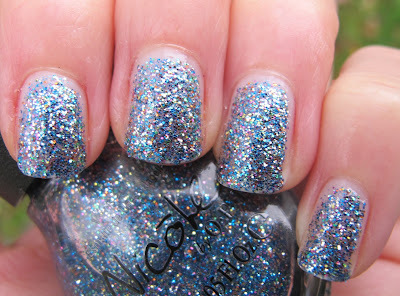 Never Enough Nails: Nicole by OPI Holiday Glitters Part Two: The Awesome-fest Continues!! 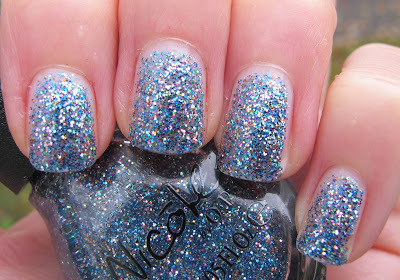 Nicole by OPI Holiday Glitters Part Two: The Awesome-fest Continues!! Hello ladies and gents!! As I type this, I am all pumped up for two reasons. One, I finally got my Halloween costume today!! I'm going to a costume party Saturday and wanted to get something cute. I settled on a purple and black witch costume with a tutu LOL. 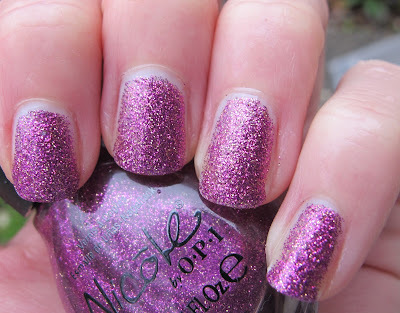 The second thing I'm excited about is the rest of the Nicole by OPI Holiday Glitters! Today I tried out My Sleigh's In The Shop and Snow-Man of My Dreams. My Sleigh's In The Shop is a beautiful red-purple fine glitter polish. 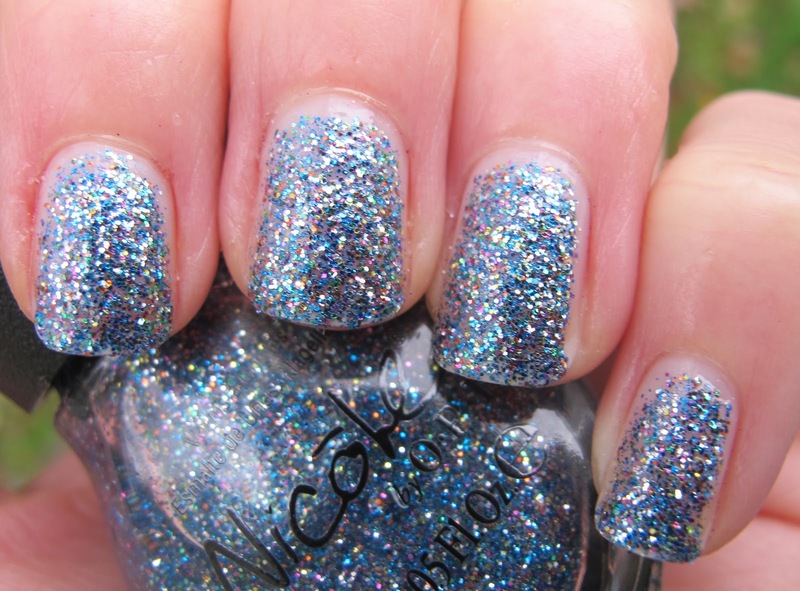 It has a clear base, but easily achieves full opacity with two thick coats or three thin coats (just like the first two Nicole by OPI Holiday Glitters). My pictures were taken today in the pouring rain, so I'm sorry for the rain drops. Also, the cloudy sky makes this polish look cooler-toned than it is. It is more of a red-purple than a blue-based purple. The formula of My Sleigh's In The Shop was nice and easy to work with. No bald spots or any problems at all!! This color is really gorgeous too, a MUST HAVE for a purple lover like myself! I wanted Snow-Man of My Dreams as soon as I saw the promo pictures. The glitter in this polish is small glitter, but it's not as fine as the glitter in the other three in this collection. 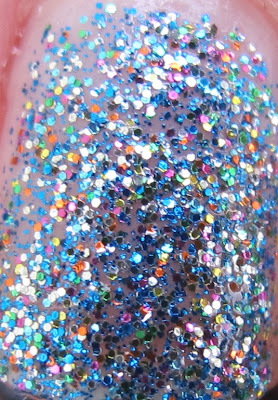 It is mostly blue glitter in a clear base, with pink, silver, orange and maybe some gold pieces mixed in. The effect of the different colors in a mostly blue polish is really cool. I think people had hoped this would be an OPI Absolutely Alice dupe, but it isn't. I will compare them, but Snow-Man has slightly larger glitter and a more multi-colored appearance. I *gasp* might like it BETTER THAN ABSOLUTELY ALICE *gasp*. This one applied nicely too. It took three thin to medium coats for opacity. Overall, all four of these polishes are AMAZING! If you LOVE glitter, you need all four. 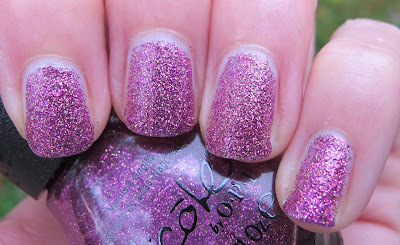 If you like glitter, but can only get two of these, my picks would be Snow-Man Of My Dreams and Glitter In My Stocking. But again, I recommend all four LOL. These will be available in November for $7.99 each in the U.S. at HEB, Sears, Stage Stores, select Target locations, Target.com, and ULTA. In Canada, lacquers will be retailed for $10.99 each in Shoppers Drug Mart, Loblaw and Zellers. Imfeelingnail-venturous- they are both really great! These four are really some of the best glitters I've tried. Ms. Jelena- I agree! Are you thinking about getting any of these?